I found the specified toilet bowl cleaner at Walmart. Pour 100 ml of the cleaner into your glass jar. 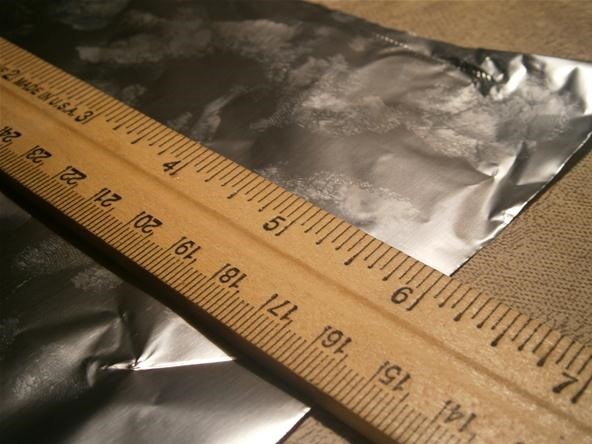 You can afford to approximate, because the reaction size will be limited by the amount of aluminum we add later on. As usual, I guesstimated based on the volume label on the bottle. 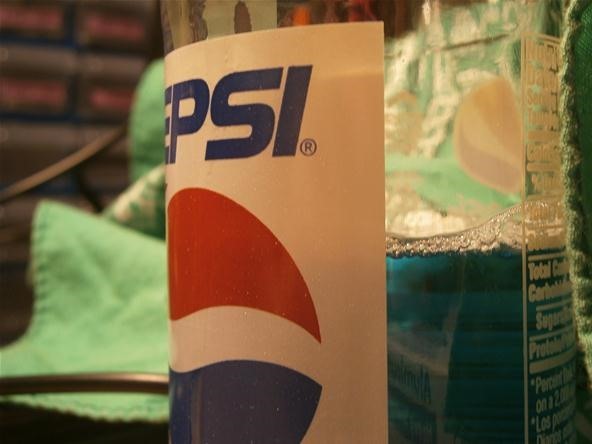 Cut a 6 inch square peace of tinfoil to put into the bottle. Do not use a bigger piece, as it could cause the bottle to crack and the balloon to explode and throw burning liquid around the room. Crumple the foil up so that it will fit through the neck of the glass bottle. Don't make a sheet any larger than 6 inches! Put on your safety goggles. Move the experiment to a place that you don't mind getting soaked in boiling liquid. Also, be sure to get your balloon ready and accessible for the next step. 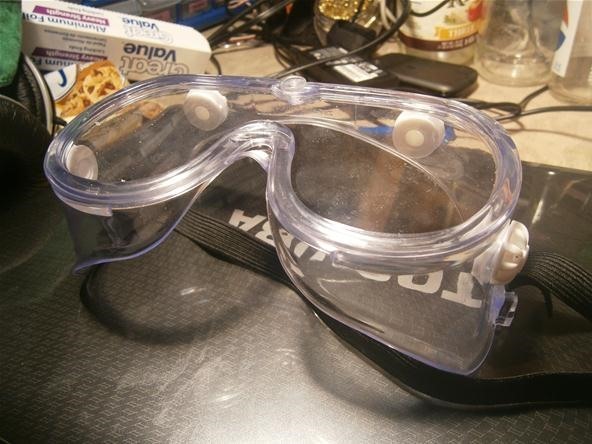 You can find decent safety goggles in the paint section of your local hardware store. 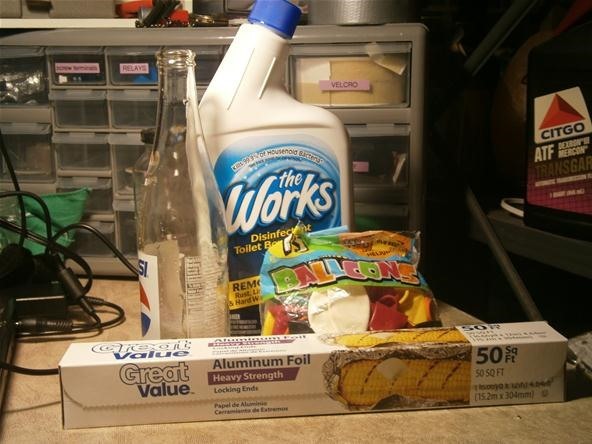 Push your crumpled aluminum foil into the bottle and immediately cover the top with your balloon. You have about 30 seconds before the reaction gets violent, so do this right away. Once the balloon is secure, stand back a few feet and watch the reaction. Wait for the bottle to cool and remove the balloon from the top. Twisting it several times before removing it will help keep the gas inside while you tie the knot. Take your hydrogen gas outside and light it on fire with a long match. The gas will disperse and burn as the balloon pops, so don't use a lighter or a regular match. You will be too close to avoid getting burned. I was so excited to make hydrogen. This inspires dreams of making hydrogen Zeppelin drones! What would you do with some homemade hydrogen? Let us know in the comments. If you try this out at home, post up a video or some photos on the corkboard. If you have any questions, just hit the forum. I am always happy to help out! Let me know if you test your vomit hypothesis. Literally writing the electrolysis article as of the moment you posted that comment. Hey i dont got that 20% hydrochloride cleaner but i am having a 10.5% hydrochloride cleaner. should i increase the amount of cleaner if yes, by how much? please give suggestions. I tried using 10% first and the reaction took over 24 hours. Yes you should double the amount of cleaner you use. I had trouble finding the works brand cleaner but finally tracked it down at walmart for less than 2 bucks. you could also go into your average hardware store and purchase muratic/hydrochloric acid, those generally have quite a good concentrate. Thanks for the advice. Is it sold under that name? Muratic acid. Hydrochloric acid is the chemical name. Muratic acid is very corrosive i have seen it rusting shelves in hardware stores while sealed in the container. BE VERY CAREFUL and USE SAFETY EQUIPMENT, Goggles, gloves etc. Good to know. Thanks zombiefire! KOH, or Sodium Hydroxide works the best. You can find it at your local hardware store (plumbing cleaner). Make sure you get the one that is 100% Lye. Make sure you wear gloves. Its highly corrosive. It works great for Electrolysis as well!!! :) BTW, if you use cleaning products with chemicals other than the base, reactions will produce poisonous gases as well. Experiment at your own risk! Test your reactants first and/or use a dropper apparatus to avoid overreactions like you had. If the balloon burst, getting the reactant on your face probably wouldn't make for a fun afternoon. Have a backup plan to slow the reaction if you're not sure. Having the bottle in a water bath (as a thermal sink) and that you can dump ammonium nitrate in would be a good one (if your glass will tolerate the temperature shock). Preferably use an overflow bottle and plastic reaction-ware. (Don't use an overflow bottle and glass(ware) together, because if your gas-line clogged, flying glass will be even less fun than flying hydroxide). How d you know that hydrogen is being produced? The gas created fills the balloon! It might be a good idea to put the rolled up aluminum foil in the balloon then attach the balloon before letting the aluminum drop down that way your not messing with it while the reaction is in process.